When you start feeling sick, you want to get well fast. You can supplement Vitamin C for immune system support. To get well, your body’s immune system kicks in. The immune system is the body’s first line of defense against sickness or disease, known as “intruders”. As long as our body’s system of defense is running smoothly, we do not notice the immune system. Your blood is made up of two kinds of cells, white and red. When the body detects a harmful intruder, the white blood cells go to work fighting them off. If they are fighting a long time, or the intruder is harder to fight off, you may experience a fever. Fever is a sign that your body is working to fight off infection, and for many is the first sign of sickness coming on. A good way to help support your body and how to build immune system is by making sure to get plenty of rest, liquids and the right kind of foods. Fruits, veggies and fresh, lean meat can all play a part in helping you stay healthy. Getting the proper amount of necessary vitamins and minerals is important in overall health, but crucial when your body is run down or sick. Vitamin C can play an essential role in that health. 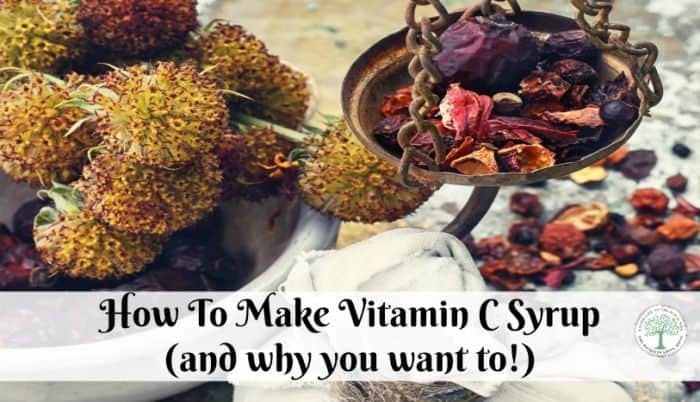 You can also help supplement Vitamin C in a natural way by making this delicious syrup. It’s a great way to help support your immune system and is easy to make. Here’s how to make your own Vitamin C syrup. Bring 4 cups of pure water to boil in a saucepan. Immediately turn down heat until the water is simmering (steaming, but not boiling). Measure and add herbs to water. Stir to mix. Let herbs simmer in water over low heat until water is reduced by half (2 cups). Pour herbal infused water into a mason jar with a tight fitting lid. Let cool until slightly warm. Add honey, brown rice or maple syrup to water. Use daily when trying to prevent sickness. *Dosage: adults – 1 TBSP. 2-3x a day — children – 1 tsp. 2-3x a day. Can also be used as a pancake topping, or adding into yogurt or cereal to let your food be your medicine. Of course, too much Vitamin C can cause upset stomachs and even diarrhea. If you experience any of this, please STOP using this and consult your doctor. What do you do to support your immune system? Will you try this syrup? Are you using fresh or dried elderberries (and rose hips, for that matter…) ? Other than elderberry, can you use blueberries? in exchange for the elderberry? Sure, but blueberries do not have the same immune support properties that elderberries do. Similar, but not exactly the same. May I ask what the brown rice adds to the concoction? I get babies shouldn’t have raw honey. Our ‘go to’ is raw honey, lemons, ginger, ACV and a little bit of garlic. It is a staple in our household in the colder months. brown rice syrup adds the body for the recipe without the fear some have of honey. I’ve read that heating up the rose hips can kill off the vit C. Is that true? I’ve considered using rose hips or other high vitamin C herbs/berries in place of elderberry, but have hesitated bc of this.